In a new theory published on arXiv today we show how a laser beam can exert control in a system with competing superconducting and charge orders. The underlying mechanism with a striking resonance for photon frequencies near the gap edge may even be used to understand light-induced superconductivity. 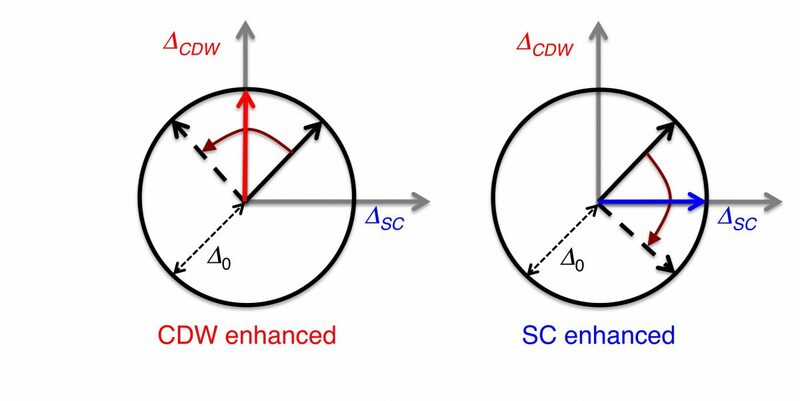 The above figure illustrates how a symmetry between the competing orders allows for low-energy excitations corresponding to a rotation of a composite order parameter towards charge order (CDW, left) or towards superconductivity (SC, right).